In which we do some green laning, move a tree, rescue a horse and FTF a geocache. At silly o’clock, Bob picked me up in his Range Rover Classic and we set off for the byways of Wiltshire. I don’t normally do early mornings but we had to be at the RV just north of Devizes by about 08.45 and it would take us a couple of hours to get there. As well as us, there was our geocaching mate Jeff in his Discovery 3, plus four non-geocachers in two more Disco 3’s. The day was officially a geocache-free day, however Jeff managed to get us a “pass” to look for a cache he’d DNFd some time ago – GC36MA9 – Log it. It was on the first byway we were going to drive so while the 2 non-caching Discos drove on, we paused to find the cache. As we drove to catch the others up, we met a fellow cacher, who happened to be standing right next to another cache – GC36M9G – It’s miles! – so we jumped out of the Land Rovers and found that one as well! After that, we caught up with the others and the laning began in earnest; we set off in the general direction of Avebury and its famous stone circle. Unfortunately, the winter weather had left several of the byways extremely wet, these had voluntary restrictions on them which we complied with and so we didn’t drive them. This meant a bit of “recalculating” by our navigator but he soon had us back on our planned route. Later, we were driving along a rutted lane which followed the hedge line of a field, when we came upon a fallen tree completely blocking the lane. We could have driven “off-piste” around it but we stopped instead. Jeff made short work of the branches with his trusty bow saw, until the tree was sufficiently manageable for us all to lift the tree and move it off the track and into the hedge. At that point, Jeff managed to get his Disco stuck in the rut and it took a gentle pull from one of the other Discos to help him get going again. At that point we all decided to back up and leave the lane for another, drier, day. After a while, we agreed that it was time to find a suitable lunch stop and we parked up in a secluded lane which ran next to a field. This field contained several horses and a couple of donkeys. We stood around munching our sandwiches and chatting to the friendly horses who came up to the fence (presumably hoping to snaffle our lunch). I noticed that one of the horses had got a back leg caught in the strap of his overcoat making him a three-legged horse . He was hopping about trying to free himself. Along with Nick (one of the Disco drivers) I hopped over the gate and the two us approached the horse. He wasn’t going anywhere in a hurry so we soon caught him. With Nick holding his head, I, being careful to keep away from his legs (as I didn’t fancy being kicked), reached under said three-legged horse and pulled his foot clear of the strap. As soon as he was back on four hoofs he scampered off across the field. Not a word of thanks. Typical horse! 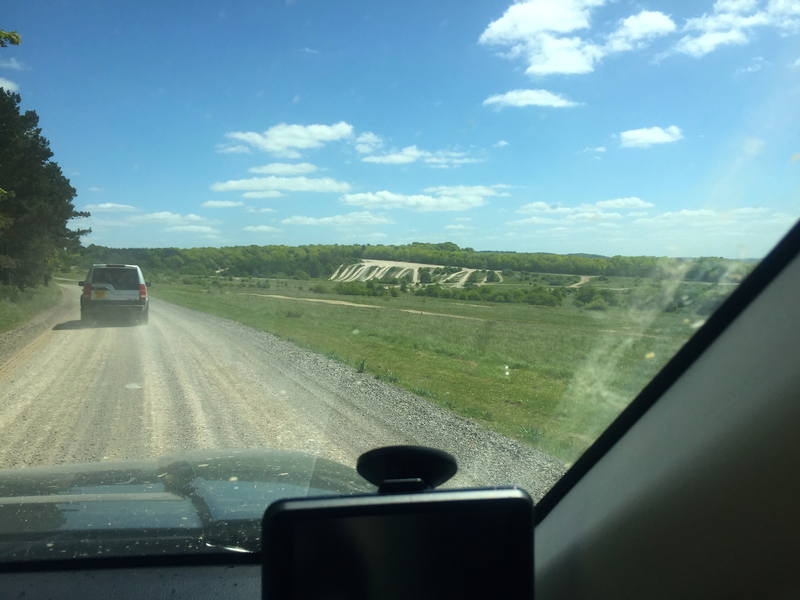 Anyway, after we’d finished our lunch we continued on our route, navigating our way in a southerly direction towards the byways which crisscross the eastern side of the Salisbury Plain Training Area (SPTA). The army are using most of the SPTA for a major exercise but the eastern side was (fortunately) open to civilian traffic over the weekend. Finally, skirting Tidworth, we reached the end of our planned route. Just enough cleaning to keep it road-legal. Looking at the map, we found that we were very close to a cache (GC401F7 – Devil’s Ditch #3), so, freed from the no-caching constraint, we set of to find it. On the face of it this was an easy one, although we still made a meal of it, eventually finding it in a place we’d allegedly searched thoroughly a few minutes earlier. Duh! After that, we drove a short way up the byway opposite and made another quick (and easy) find. Back on the blacktop, we stopped once more for what we thought would be our last cache of the day, then we set off for home. As we drove homewards along the M3, we discussed some new local caches which had been published that morning while we were en route to our RV. I called them up on my iPhone and discovered that one of them had not had a find logged. Could it be that nobody had FTFd it all day? I input the cache’s coordinates into Bob’s satnav and we continued on our way with a slightly amended plan. When we got closer, I checked again – still no log on the website! So, at about 19.05 we arrived near to GC5NXZT – A cache with a view too. It seemed only a minute or so before I spotted the container. We opened it and… a clean log. FTF! Incidentally, that was my first FTF for a whole year – partly due to my unwillingness to compete with the local FTF hounds – so it was a super result. Bob and I were pretty pleased with that; we jumped back into the Range Rover and drove to the other new cache (which had already been FTFd) and found that as well. Well we had to pass it on our way home anyway. After that it was back home for tea and medals. For a non-caching day it had turned out to be pretty successful: 7 caches found and one of them a FTF. Excellent!